SUDDEN IMPACT: Princeton University field hockey freshman standout Julia Reinprecht dribbles the ball in a game earlier this season. 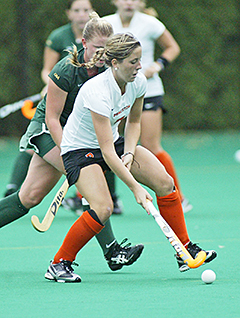 Last Sunday, Reinprecht scored a goal as Princeton topped No. 5 and previously unbeaten Connecticut 3-1. Reinprecht has six goals and two assists this season to rank third in scoring for the Tigers.